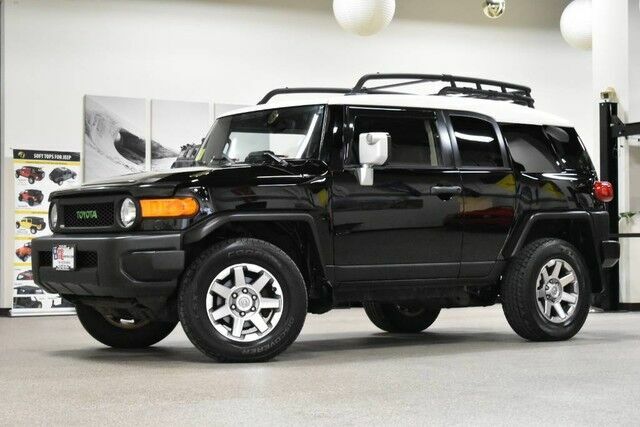 2014 Toyota FJ Cruiser 4WD is a 1-Owner vehicle with clean Carfax history. This is a very good looking truck and it is the last year of making the FJ, please look at all the options to see how clean this vehicle is. This Toyota includes: CONVENIENCE PACKAGE Power Mirror(s) Privacy Glass Auto-Dimming Rearview Mirror Back-Up Camera Power Door Locks Keyless Entry Cruise Control UPGRADE PACKAGE Locking/Limited Slip Differential Aluminum Wheels CD Player Rear Parking Aid Universal Garage Door Opener Leather Steering Wheel Traction Control CD Changer Satellite Radio Premium Sound System Auxiliary Audio Input MP3 Player HOOD PROTECTOR (PPO) PASSENGER ARMREST (PPO) ROOF RACK (PPO) Luggage Rack *Note - For third party subscriptions or services, please contact the dealer for more information. * This vehicle is loaded with great features, plus it comes with the CARFAX BuyBack Guarantee. Off-road or on the street, this Toyota FJ Cruiser handles with ease.